Butter both slices of bread with 1/2 teaspoon of butter spread each. 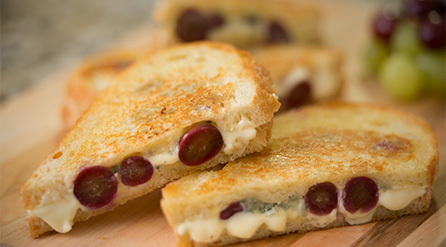 Spread the Brie on the unbuttered side of one slice of bread and top with the blue cheese crumbles. Add the grapes on top of the cheese, pressing each one down a little so that they stick. Drizzle with the honey. Top with other slice of bread, butter side up. Preheat non-stick skillet over medium heat. Place sandwich in pan, flipping once, until the cheese melts and is slightly golden brown on each side.